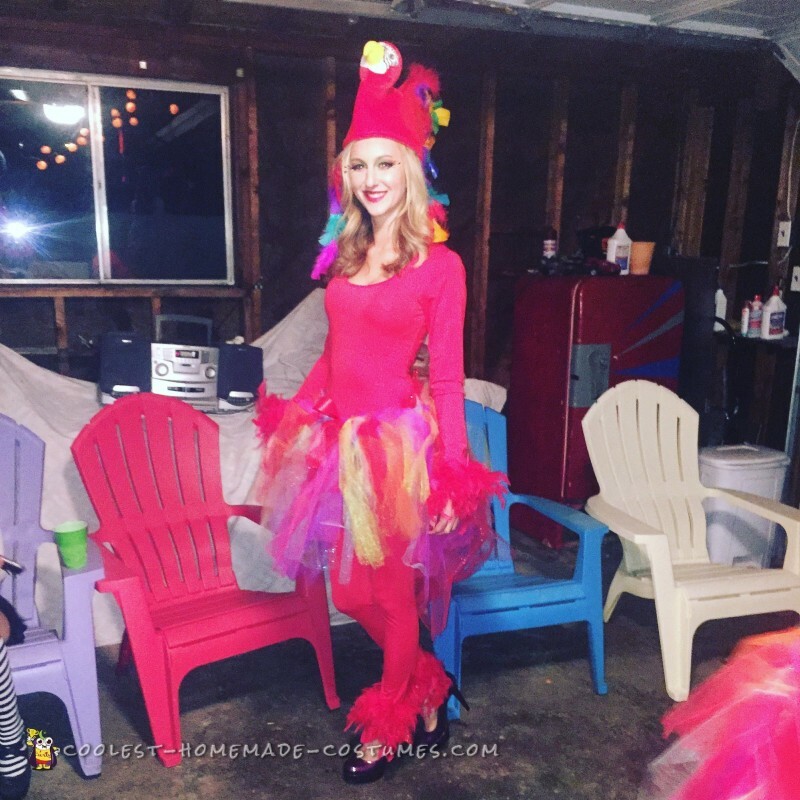 Most people downright stared at us when we waddled into a Halloween bash in downtown Detroit with floppy bird hats, feathered eyelashes, a multi- colored wrap around tail, a full red jumpsuit with feathers pouring out of our arms, legs, and tails. We met some other animal friends in the club (monkeys, penguins, etc) and at one point there were three monkeys and three parrots dancing in the booming club; we loved it. We began to take on a unique persona that night impersonating birds. In fact, I believe we talked in these high-pitched voices throughout the entire night. When people asked what are you guys, we proudly did our bird dances and talked in our squeaky parrot voices. Whether we were annoying to others we created a memory that will last a lifetime. Our inspiration stemmed from wandering through target to search for sweetest day gifts. My girl friends and I came across these comical animal hats. The first stuffed hat we grabbed and pulled over our ears were parrot tops. We instantly started cracking up and all spoke allowed “we should be parrots for Halloween!” “Hola Hola.” We would be Las Tres Amigas name Coco, Lulu, and Kiki. Off to Joanne’s we went to buy fabrics, feathers, and much more supplies to create what we depicted as parrot costumes. Creating this costume was a long, but super fun process. We started with the hats and added many more feathers and colors. After collecting ideas off of Pinterest and various websites we decided to make our parrot tails out of 15 different colored tool fabrics. We used a material, which had 6 sections of holes and cut and tied the tool pieces onto the holey fabric. The outsides of the tails were all different colors and the back was longer and different shades of red. Our hairstylist friend Lulu cut the fabric in layers to make the tail seem more real when we were finally done after 10 dedicated hours. 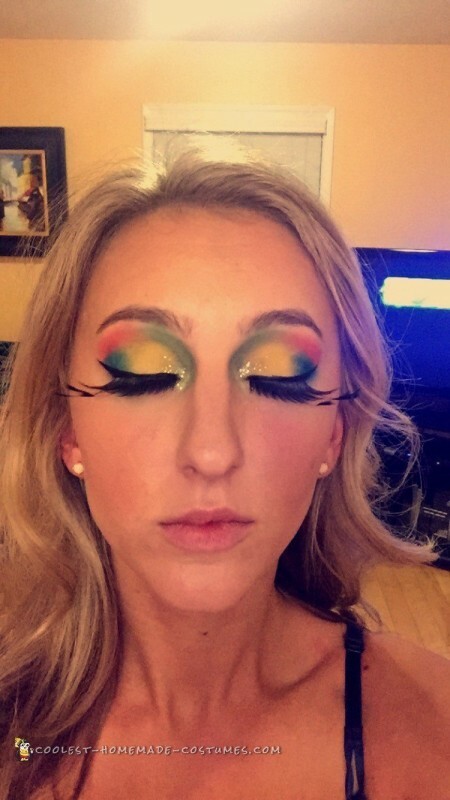 We added red feather rope to our hands and feet and had our makeup done in bright colors in which included feathered eyelashes. There were some downfalls to our colorful, poofy costumes; we could barely fit into the car. Our hats touched the top of the car roof and our skirts barely fit into the car door. Oh yeah, peeing was one thing that we did not take into consideration. In order to use the bathroom we had to remove all our arm feathers, our tails, and our body suit. Who knew being going to the bathroom, as a parrot would be so difficult. I advise not to walk around people who are smoking with these flammable tails. We absolutely loved dressing up as parrots. Many people before seeing our costume were like “what your being a parrot?” Yes, were being birds. We knew that our costumes would be unique and outspoken on Halloween. Every single person turned their heads when we walked past them. We received 60+ compliments and won best costume at the house party we partook in earlier. 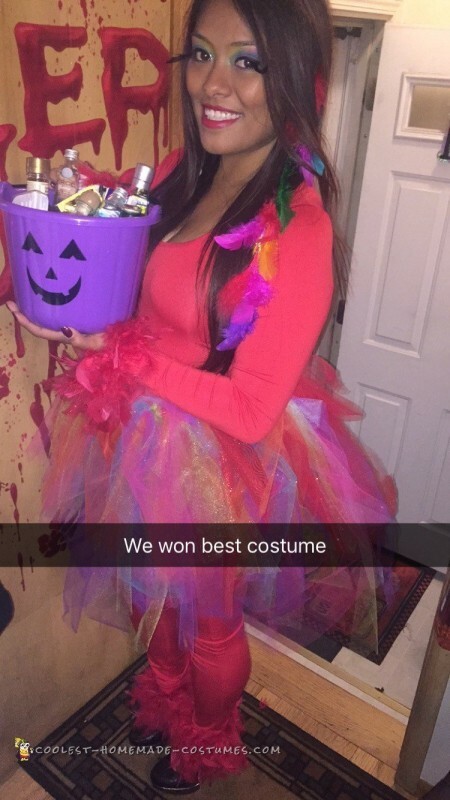 The colors, the feathers, and the impersonations made our costume and the greatest Halloween ever!